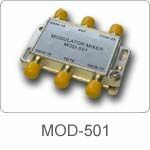 MOD-501 can join together Antenna or CATV signals with 4 sets OM-167M or OM-168M TV Modulators. Can let the Antenna or the Cable TV be increased CH-14,16,18,20. Or CH-15,17,19,21,etc. Four channels.